We are a computer aided drug discovery lab, developing and using computational tools for drug discovery research. Our main research interests include developing novel therapeutic agents by using structure based and ligand based drug design methods and understanding non-covalent interactions in protein-ligands complexes. 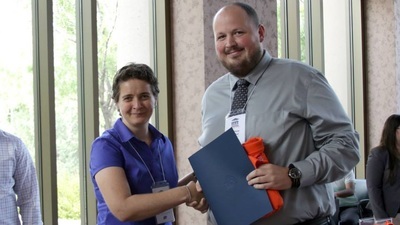 Congratulations to our group member "Ibrahim Salama" for winning "Best Undergraduate Student Presentation" for the Engineering, Applied & Computational Sciences category at the Spring 2019 COURI symposium. Dr. Sirimulla is organizing a symposium on "machine learning scoring functions" at the 2018 Fall ACS National Meeting in Boston. Lab member Daniel Castaneda Mogollon presented "OpenDMPK: An Open Source Toolkit for the Prediction of Drug Metabolism and Pharmacokinetic Properties" at the Medical Center of the Americas Foundation. 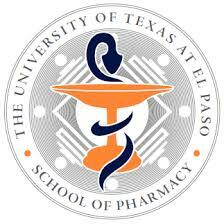 Lab members Ibrahim Salama and Claire Govea presented a poster at UTEP Spring COURi symposium. Dr. Sirimulla presented "DLSCORE: deeplearning based scoring fucntion for reliable protein-ligand scoring" at the 2018 Spring ACS National Meeting in New Orleans. Dr. Sirimulla is serving as a reviewer for NIH DDNS and Molecular Probes study section. Dr. Sirimulla received BBRC pilot grant to design novel drugs for axon degeneration. Dr. Sirimulla attended Gordon Research Conference- Computer Aided Drug Discovery in Mount Snow, vermont. Welcome Neetha Mohan, postdocotoral researcher from Osaka University, who will be joining our lab in May. Miguel Rivera, Undergraduate Research Assistant, presented a oral and poster presentation at ACS National Conference San Francisco. Welcome Filip Fratev, postdoctoral scholar, from Bulgarian Academy of Sciences to our group. Congratulations to our group member "Gerardo Uranga" who recieved summer intership offer from Microsoft. Our Manuscript on sulfur (chalcogen) bonding in protein-ligand complexes is now published in JCIM. Our group member "Miguel Rivera" attended "Hands on Worshop on computational Biophysics" on Dec 12-16 2016, in San Franscisco. Dr. Sirimulla is organizing a session on "Advances in Highthrough put screening" at the 252st ACS National meeting in San Franscisco April 2-6 2017. 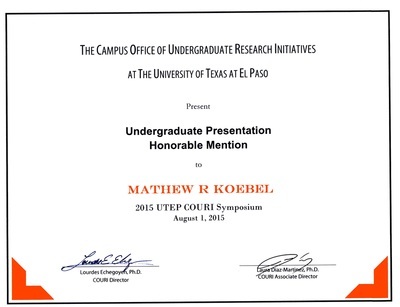 ​Congratulations to our group member, Mathew Koebel on winning the best poster award at the EVB2016, Uppsala, Sweden. ​Congratulations to Mathew Koebel for receiving Outstanding undergraduate poster award at the ACS National Meeting in San Diego. Dr. Sirimulla and Mathew Koebel featured on STLCOP website. Dr. Sirimulla chaired a session on datamining of chemical databases at the 251st ACS National meeting in San Diego March 13-17 2016. 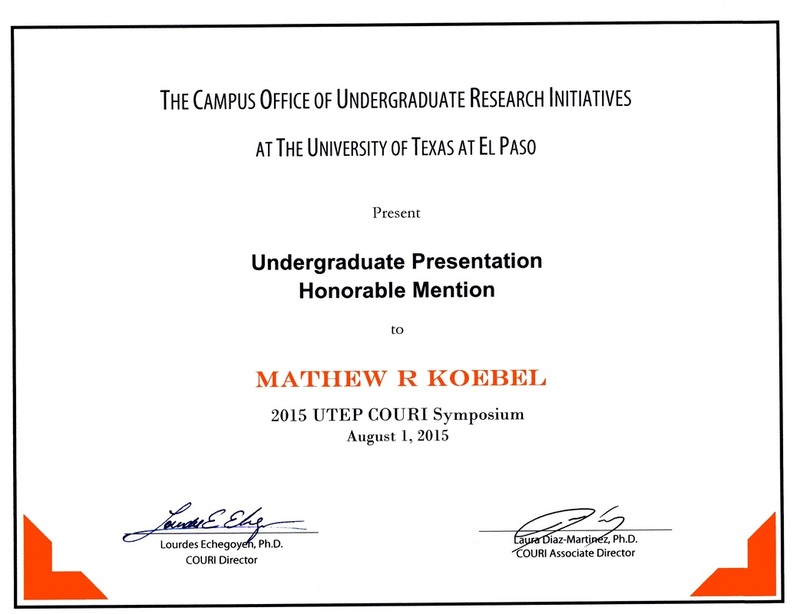 Congratulations to Mathew Koebel for receiving Honorable mention award at the 2015 UTEP COURI symposium.